‘Sketching’ is a unique book of its kind. Written by well-known illustrator Pratap Mulick who has planned it on the basic of lifelong artistic exploration of his career. 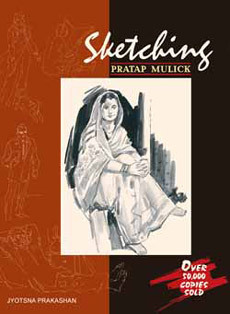 The author has attempted to highlight various aspects of sketching and figure drawing. The book undoubtedly is very useful for students and artists as it shows Indian models in their cultural and historical diversity. Set in easy-to-read type, each topic has been captioned in simple terms. The topics included are under the following categories: Anatomy, Costumes, Portrait, Actions, Perspective, Cartoons, Shading, Composition, Animals and Birds, Nature Drawing, Outdoor Sketching, Illustrations and Comics. The book would prove valuable to the students and lovers of figure drawing and portrait painting.